So when you read this you might be sitting at your desk, at home in front of the TV, at an airport, in a plane, in your garden, ….. Well, I am writing this with a stunning view across the Mediterranean Sea. Last year there were three months of unhealthy smog in Kuala Lumpur and back then we decided to spent this August, September and a good part of October in Cyprus with guaranteed clear and healthy skies. It’s safe to say that no one enjoys long-haul flights and although Francien and I have flown so many times, we do not either. After a change of planes in Doha, we continued our 15 hour journey from Kuala Lumpur to Larnaca. Our flight path avoided the many airspaces in the Middle East which are riddled by wars. Our Airbus 320flew parallel to the northern border of Saudi Arabia, passed the southern tip of the Sinai, then turned north towards the Mediterranean Sea. Crossing the desolated pale brown Saudi Arabian desert, the only other colour came from the scattered circles of green irrigated vegetation. 36000 feet below the sun beat on the sands, cut with ancient river beds. I was thinking of all the fighting taking place in this part of the world. Skirting Israeli airspace, our eyes caught the deep blue Gulf of Aqaba. On board, women from Sri Lanka and Philippines on their way to their jobs in Cyprus, a group of Israeli surfers on their way back home, a few Cypriot families and some European tourists (living in the Gulf region) looking forward to reach their destinations. As our plane descended crossing the Mediterranean Sea, I saw the Lebanese mountains to the East and a few minutes later the Taurus Mountains in Turkey. We have been regularly traveling to Cyprus since 2005 and it is always comfortably familiar to see the already yellowing island cut by valleys covered with olive trees and laced with rocky bays. As the plane nearly seemed to touch the water, I recognized the diving boats anchored above the Zenobia shipwreck, the Larnaca port, the palms on the corniche and the dry salt lake deserted by the flamingos (in the summer they are at the Caspian Sea). A glimpse of the Halla Sultan Tekke mosque(one of the holiest Muslim shrines, because the honour mother of prophet Mohammed is buried here) among palms and cypresses just before the plane touched the runway. A long queue at passport control for non-EU citizens gave me a happy feeling as we were whisked through at the empty EU citizens line. It took us two days to tidy up our penthouse and sat down on the terrace overlooking the sea. It was 33 °C and within a few hours of daybreak the heat- haze covered the sea, blurring the boats. Without air-conditioning we felt sticky and grimy, with no afternoon thunderstorms to look forward too. Francien in the historic harbour of Paphos. The harbour arm has a Roman breakwater sunk under the water. A cruiseship anchored offshore. Strolling one afternoon in the Paphos harbour, the tattoos of half-naked English tourists caught our eyes. We are used to the Malaysian people who are shy, polite and respectful with many young men having girlish figures. Here the masculine Cypriot men have eagle noses and slightly flat foreheads. They stand one foot taller, with a stern look, tight smile and piercing eyes. They are very proud people and dare I say it? - hot headed. Cyprus is everything Malaysia is not: Just a few days ago we shopped in modern malls in Kuala Lumpur heaving with local Chinese, Indian and Malay shoppers and businessmen and tourists from Europe and Australia, full with stores where the password is clearly "money is no object". This week we did our grocery shopping in the local supermarket frequented by Cypriots, Russians, Ukrainians and British people who made this island their new home. The cashiers were from Sri Lanka and some eastern European countries. Did I mention the 24/7 lifestyle in Kuala Lumpur? Oh, in Cyprus most shops close each day for lunch, Wednesday and Saturday afternoons and Sundays! The good news is: I hate shopping! Back in Kuala Lumpur we used the underground during rush-hour and had to push our way into the train that was already full. Here in our village (Tala has 3500 inhabitants) public transport? Forget it. Two pink pelicans in the harbour entertain the tourists. One of them is nicknamed 'Coco'. 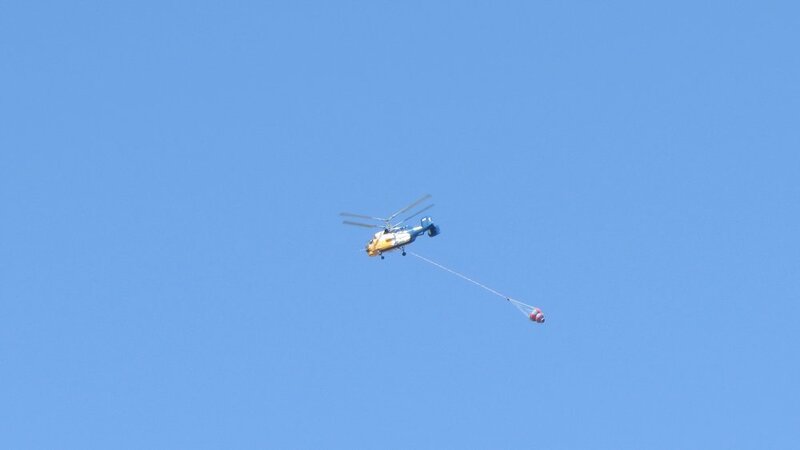 Firefighting helicopter on route to yet another fire in the mountains. The water container was filled with seawater and will be dumped on the fires raging in remote area's. Living in Kuala Lumpur is living in an air-conditioned world where even walkways are cooled to provide pedestrians comfort in the tropical heat. Not so in Cyprus. Francien and I love the outdoor living here. The sounds of daily life in our village are different from Kuala Lumpur. Sleeping with all windows open, in the morning we are awaken by the sound of pigeons, chickens, dogs barking across the valley, church bells ringing. Late afternoon the grocer driving a pick-up truck sounding his music tune, the mail lady on her motorbike, the occasional truck crawling up the steep hill. The neighbours talking to each other (talking loud is not an offence in this country) and sometimes the rhythmic “wop-wop” sound of a firefighting helicopter. In the evening there is complete silence across the valley, occasionally interrupted by the cry of an owl or barking of a dog. In the weekend youth race with their quads up and down the steep hills. We enjoy not hearing the construction building going on in Kuala Lumpur, the buzz of the air-conditioning units and traffic crawling through the streets. No construction dust or smog in the air, but instead the fresh smell of olive trees. On our terrace with view across the Mediterranean Sea. The distance to coast is 2000 meters as the crow flies. Francien and I are looking forward to meet up with friends and family here in the middle of the Mediterranean Sea for the next three months before returning to Kuala Lumpur. Hooray, we will be living outdoors on our terrace perched high on top of a hill, exploring the island when the temperatures are not too high, enjoying its cultural activities and taking in the ever changing views across the sea.